The Dow Jones Industrial Average is up! The S&P 500 is up! NASDAQ is way up! But none of those have anything on the collector car market, which is nothing short of absolute insanity at the moment. And this chart is proof. What you're seeing here, courtesy of the collector car market wizards over at Hagerty, is the price of a 1955 Mercedes 300SL Gullwing as compared to three major stock market indices and the price of gold. While the economy has been soaring for some, it's been a rocket ship to the greater reaches of the Universe for the world's obscenely wealthy. And perhaps nowhere is that reflected greater than the price of one little old German car. For reference, one sold last August for $2,530,000. 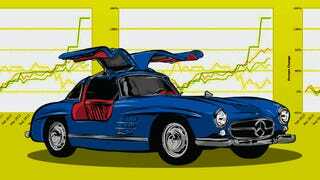 As you can probably make out if you expand the chart, the price of a 300SL Gullwing has increased over 150% since 2010. Compare that to the stock market, the greatest increase of which on this chart has been in the NASDAQ index at only 92%, and you can see that to the stock market is clearly just dealing in peanuts at this point. The BMW 507 Roadster alone has seen its price double in just 12 months, according to Hagerty. And while it's a beautiful car, it's good looks haven't doubled in the same time. There continues to be some speculation that prices simply cannot continue this arc for much longer, though the "if" of this question is less insightful than the "when." That million-dollar answer is yet to have consensus. There's nothing inherent about collector cars, and especially German ones, that could be behind their massive rise in worth. There's no billionaire maniac out there, crushing Gullwings with a sledgehammer until there aren't any left. In fact, people are still finding (albeit completely decrepit) Gullwings in all sorts of new places, from time to time. Hagerty has actually said that the Ferrari market is so hot, it's "radioactive." And in case you never went to school, you should never get close to things that are radioactive, because they'll decay and then kill you in a horrifically painful death. But there are two other big factors at play, besides an overheated market. The first is the aforementioned rise in income inequality. As the wealthiest get even richer, they can afford to bid higher and higher prices on the highest-end of collector items. And the second, as the fine folks at a recent Hagerty presentation told me, is a gerontological and generational issue. As those who pined for a Gullwing in their youth finally grow into the requisite splendor of moneyed old age, their lust for an old Mercedes never went away. And since they all still want one, and many can now buy one, the real demand has gone up while the supply has stayed the same. Plus, and this is me purely conjecturing, there's probably a whole metric crapton of investment speculation going on. Until, you know, the revolution comes.